Any broker will tell you how many successful sales are concluded after the buyer has thoroughly enjoyed a charter on a superyacht. After a week or 10 days aboard, hes had the opportunity to get a feel for the yacht, enjoy all its facilities and appraise the professionalism of the crew before making an offer. Here we present a selection of five superyachts currently for charter and sale, giving potential owners the opportunity to try before they buy. Fraser Yachts in Fort Lauderdale is offering Delta Marines luxurious 73.2m motor yacht Laurel for charter in the Mediterranean this summer. The spacious interior, designed by Donald Starkey, is rich and inviting. Moreover, all the guest areas  including an observation lounge, library/theatre room, sky lounge, gym, formal dining room and main saloon  are wheelchair accessible. The luxurious atmosphere is enhanced with English wool carpets, the finest linens and an extensive inventory of exquisite china. Accommodation includes a full width master suite on the main deck with a private office and two private verandas. On the lower deck, there are four spacious VIP cabins and one cabin with a queen bed, single bed and a Pullman berth. A seventh cabin, set up as the massage room, can be used for staff. Kayaks, wave runners, tenders and additional water toys are easily accessed from the large beach club at the stern. 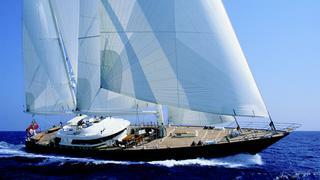 The weekly charter fee on Laurel is 476,000 in low season and 497,000 in high season and special events. 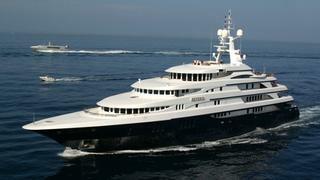 Laurel is also listed for sale by Fraser Yachts asking $79.5 million. Ocean Independence is offering the 70.1m motor yacht Reverie for corporate charter in 2012 at events like the Monaco Grand Prix and Cannes Film Festival. At the time of her build in 2000 she was the largest superyacht by tonnage built by Benetti and, despite her 70m, Reverie sleeps just 12 guests for charter in eight cabins with a further two cabins available for personal staff. Internally, her six decks (all united by a lift) include one that is largely devoted to the owner. This includes a master suite that revels in a magnificent bedroom with panoramic forward views over the private terrace, sumptuous his-and-her bathrooms and vast walk-in dressing rooms. The deck also offers two further family cabins (each with a double and a single bed), a study, an owners saloon and a circular inside-outside dining room. Of the remaining guest cabins, four are identically sized double cabins with en suite bathrooms situated on the lower deck and an impressive VIP cabin which occupies the forward element of the main deck superstructure. Guest areas include a library and a pizzeria. Reverie is also listed for sale with Ocean Independence asking 65 million. The iconic 52m sailing yacht Galaxia is available for charter this summer with Yachting Partners International. Launched to much acclaim in 1997 in Viareggio under the name Liberty by renowned Italian yard Perini Navi, the 52m twin screw Bermudian ketch Galaxia is the yacht that re-wrote the book for large flybridge sailing yachts. 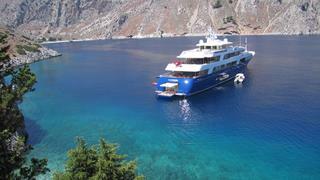 Weekly charter rates aboard Galaxia start at 140,000 in low season and 157,500 in July/August. 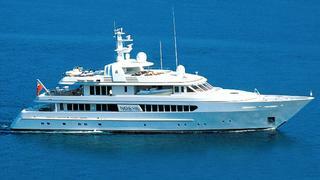 Galaxia is also listed for sale with Yachting Partners International asking $22 million. 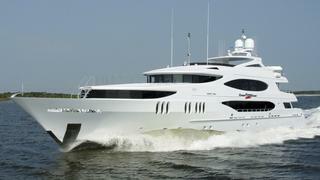 International Yacht Collection has the 49.07m motor yacht Zoom Zoom Zoom listed for charter. Built by Trinity Yachts in 2005 in aluminium to ABS class, this superyacht boasts an elegant, sophisticated interior by Evan K Marshall. MCA compliant, accommodation is for 10 guests in five cabins including a split-level master suite. Zoom Zoom Zoom is listed for sale with International Yacht Collection asking $22 million. Fraser Yachts has listed Feadships 48.2m motor yacht Noa VII for charter in the Eastern Mediterranean this summer. Built by De Vries in 1997 to Lloyds class and MCA compliant, Noa VII has a classic interior by John Munford with art deco motifs. Accommodation is for 12 guests in five cabins including a a full width master suite on the main deck, while twin 805hp Caterpillar engines give her a range of 3,100 nautical miles. Noa VII is listed for sale by Fraser Yachts asking 19.5 million.